It’s been a while since I wrote a Wearability Wednesday Post. 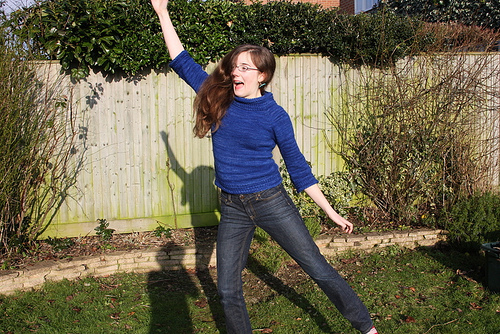 This is a series in which I revisit a knit garment and look at its wearability, style and durability. Let’s face it, sometimes you knit something that seems just wonderful at the time, and then it never gets worn. Maybe it’s the wrong colour, or the wrong length, or just doesn’t fit in with your style. Sometimes, on the other hand, you knit something that hits all of the right buttons and you wear it to death. Wendy is a great designer, who understands that every body is different; she incorporates tailoring tips into her patterns to help you get just the right fit. I would highly recommend this book to any sweater knitter. Wendy has a new book out, Custom Knits 2, which I haven’t had a chance to look at yet, but I would bet it’s also great. 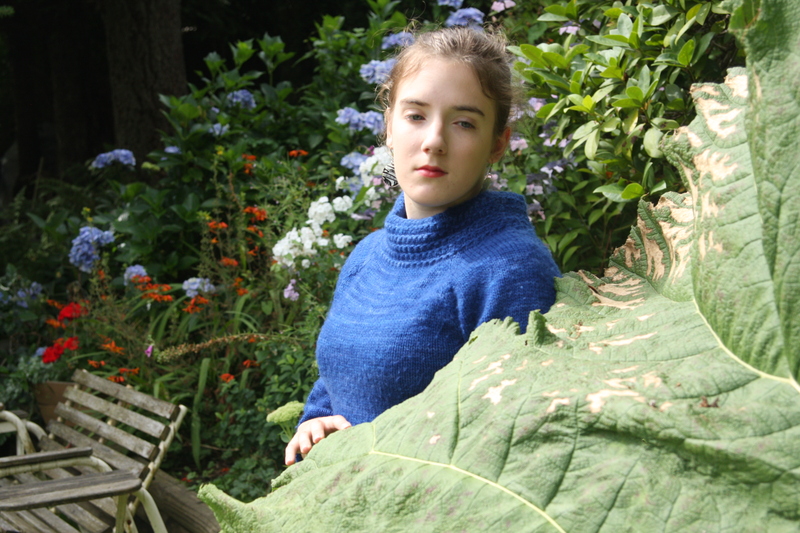 To go back to the Ingenue, what is it about this sweater that makes it a keeper? From Leah’s perspective, it is incredibly soft, cozy, easy to wear, goes with lots of things, can be dressed up or down, gets noticed, and is an absolutely gorgeous colour. From a knitting perspective, it is easy as pie to knit, but still manages to not be too boring. 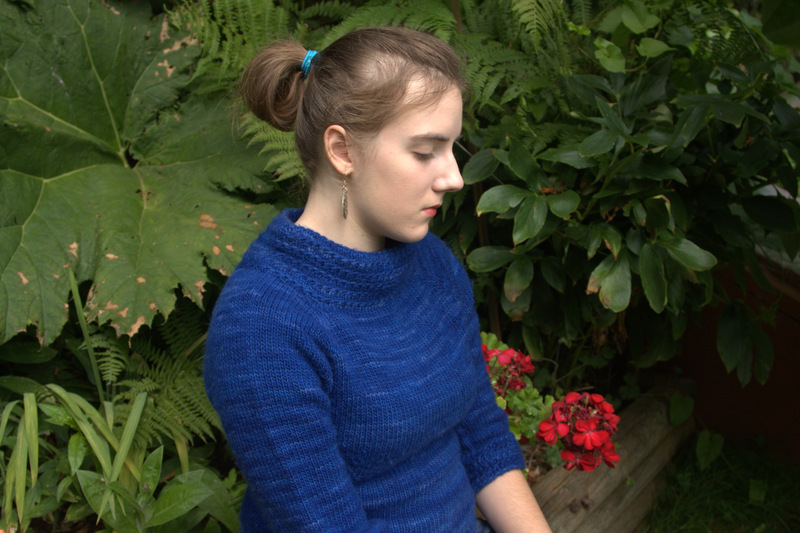 There are nearly one thousand Ingenues up on Ravelry. This makes it a very popular knit. It manages to look good on most people. I have seen some seriously big, curvy women rocking their Ingenues; you don’t have to be young and gorgeous like Leah to carry this off. It has some panache. 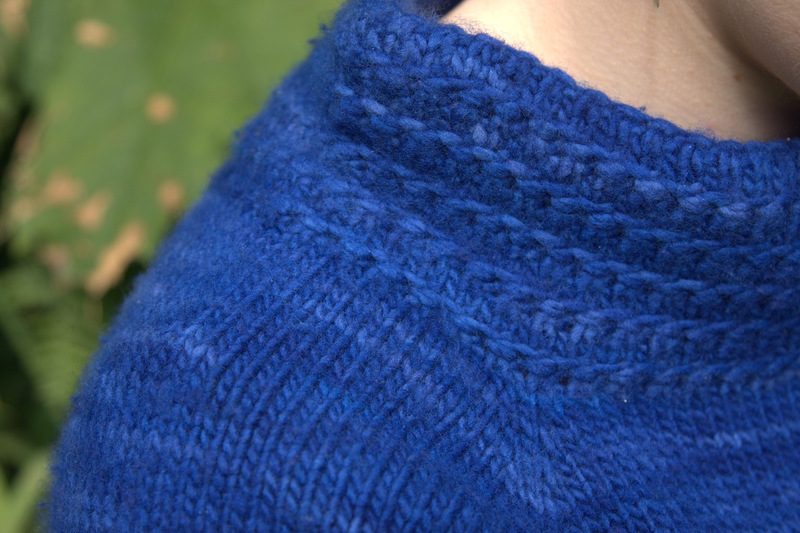 The absolutely best thing about this sweater (which is also the worst thing) is the Malabrigo. The colour is Fantastic. The photos can’t do it justice. It is an amazing, rich, beautiful, textured, deep blue that is absolutely mesmerizing. It does not look like any sweater that you could buy in a store. When we were in Vancouver, Leah got stopped in a parking lot of a Chinese restaurant on Commercial Drive by a father accompanied by his kids. He wanted to know where she got it (and was really blown away by the fact that someone actually knit it for her). It is also unbelievably soft. Malabrigo has to be felt to be believed; it really is that soft. And this, I’m afraid, is also it’s downfall. Malabrigo is so soft, that it pills almost instantly. The first time you pull it on, it will start to pill. The photo below shows how beautiful and lovely the sweater is, but if you look closely, you can see that it is definitely pilling (this despite having just been washed and de-pilled). After a couple of washes, the whole fabric takes on a fuzzy patina. In the future I would think carefully about what kinds of projects I used Malabrigo in. I wouldn’t choose to use it in a pattern that requires crisp stitch definition. Malabrigo isn’t crisp. But it is soft as butter, and luxurious to wear. 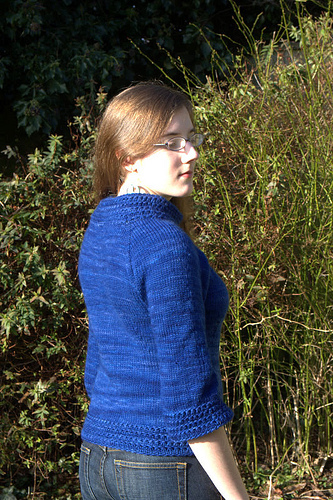 The next time I knit up an Ingenue, I would probably use Malabrigo, and I would definitely knit it for me. 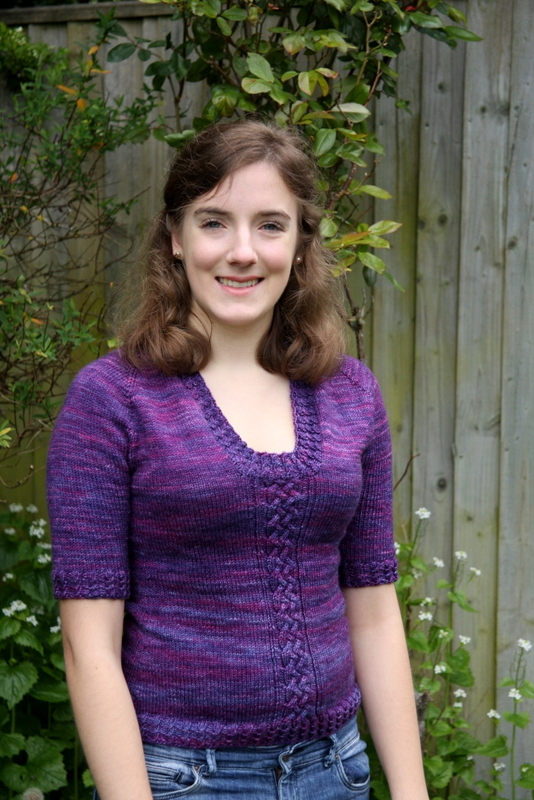 This entry was posted in Wearability Wednesday and tagged Custom Knits, Ingenue, Knitting, Malabrigo, Malabrigo Merino Worsted, Wendy Bernard by knitigatingcircumstances. Bookmark the permalink. I have a Malabrigo fetish as well. My Gaptastic cowl became my blankie last winter. Both of those sweaters are lovely designs, and beautifully knit.